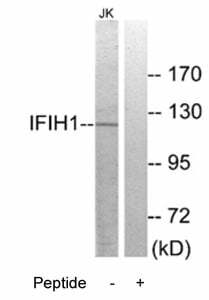 IFIH1 antibody detects endogenous levels of total IFIH1 protein. Rabbit IgG in phosphate buffered saline (without Mg2+ and Ca<2+), pH 7.4, 150mM NaCl, 0.02% sodium azide and 50% glycerol. The antiserum was produced against synthesized peptide derived from C-terminal of human IFIH1. Small volumes of anti-IFIH1 antibody vial(s) may occasionally become entrapped in the seal of the product vial during shipment and storage. If necessary, briefly centrifuge the vial on a tabletop centrifuge to dislodge any liquid in the container`s cap. Certain products may require to ship with dry ice and additional dry ice fee may apply. Western blot analysis of extracts from Jurkat cells, using IFIH1 antibody. NCBI/Uniprot data below describe general gene information for IFIH1. It may not necessarily be applicable to this product. IFIH1: Innate immune receptor which acts as a cytoplasmic sensor of viral nucleic acids and plays a major role in sensing viral infection and in the activation of a cascade of antiviral responses including the induction of type I interferons and proinflammatory cytokines. Its ligands include mRNA lacking 2'-O- methylation at their 5' cap and long-dsRNA (>1 kb in length). Upon ligand binding it associates with mitochondria antiviral signaling protein (MAVS/IPS1) which activates the IKK-related kinases: TBK1 and IKBKE which phosphorylate interferon regulatory factors: IRF3 and IRF7 which in turn activate transcription of antiviral immunological genes, including interferons (IFNs); IFN-alpha and IFN-beta. Responsible for detecting the Picornaviridae family members such as encephalomyocarditis virus (EMCV) and mengo encephalomyocarditis virus (ENMG). Can also detect other viruses such as dengue virus (DENV), west Nile virus (WNV), and reovirus. Also involved in antiviral signaling in response to viruses containing a dsDNA genome, such as vaccinia virus. Plays an important role in amplifying innate immune signaling through recognition of RNA metabolites that are produced during virus infection by ribonuclease L (RNase L). May play an important role in enhancing natural killer cell function and may be involved in growth inhibition and apoptosis in several tumor cell lines. Monomer in the absence of ligands and homodimerizes in the presence of dsRNA ligands. Can assemble into helical or linear polymeric filaments on long dsRNA. Interacts with MAVS/IPS1. Interacts with V protein of Simian virus 5, Human parainfluenza virus 2, Mumps virus, Sendai virus and Hendra virus. Binding to paramyxoviruses V proteins prevents IFN-beta induction, and the further establishment of an antiviral state. Interacts with PCBP2. Interacts with NLRC5. Interacts with PIAS2-beta. Interacts with DDX60. By interferon (IFN) and TNF. Widely expressed, at a low level. Expression is detected at slightly highest levels in placenta, pancreas and spleen and at barely levels in detectable brain, testis and lung. Belongs to the helicase family. RLR subfamily. 2 isoforms of the human protein are produced by alternative splicing. 1. our results establish a distinct role for IFIH1 in apoptosis, inflammation, and autoantibody production, and explain the molecular basis of these three risk alleles for SLE pathogenesis.